Chichester College have had the opportunity to reciprocate Germany's generosity back in January, by welcoming European furniture making students from as far as Iceland, France, Croatia and Estonia. The furniture department of the college ran workshops, demonstrating 'cabinet making' techniques from the 17-21 March. 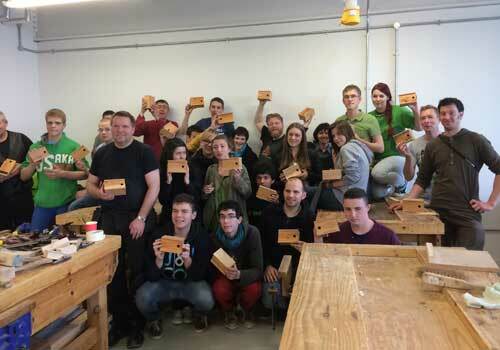 Germany was the first of seven 'Teach Me Wood' European workshops - under the Leonardo da Vinci programme - to be carried out over a two year period and Chichester College hosted the second trip. The Leonardo da Vinci programme is an EU funded Lifelong Learning Programme for young people, aged 18 and above, who want to improve both their working and language skills, while experiencing life in another European country. The programme is also an opportunity for the participant and receiving organisation to exchange knowledge and ideas and to gain understanding of others by comparing their different cultures. A Leonardo mobility project involves a sending organisation, a hosting organisation and one, or a group of individuals - selected on a motivation or competence basis. It includes continuous tutoring, monitoring and a subsequent dissemination of ideas by both the sending and the hosting organisations. The 'Teach Me Wood' European visitors to Chichester College were 'meeted and greeted' by Principal Shelagh Legrave, who encouraged them to see the beautiful sights of Chichester, which has a wealth of architectural design around its walls. When the students were not in workshops learning how to make 'presentation boxes', they visited the Weald and Downland museum, Chichester Cathedral and the prestigious Rolls Royce motors factory. Students and staff from the European countries were extremely impressed by our new state-of-the-art Construction centre and were awe-struck when they saw the facilities we have as a College. 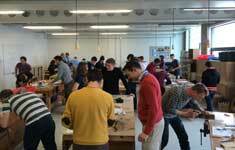 Furniture making lecturer Christian Notley said: "I think we can declare it as a huge success for both our visitors and our own students, who have the opportunity to exchange ideas and skills from countries across Europe." Principal Shelagh Legrave said: "What a fantastic achievement and it just goes to show what passionate and motivated staff can achieve and how brilliant these European partnership projects can be. Thank you Sean especially for your amazing work!"